This site is dedicated to the making of high quality, attractive functional pottery. Potters over the centuries have been responsible for providing some of the most durable archealogical objects while at the same time meeting current needs for vessels used to store, prepare, and consume food. Today, as more people engage in the making of pottery without the formal training of an apprenticeship program common in earlier times, there is a need for having a source of basic information on how to make high quality work. Indeed, too much of the work I see being offered for sale is not of high quality and serves to give studio potters a bad reputation when compared to cheap manufactured pottery. I believe it can and should be the other way around. Many professional studio potters can and do make pots that are entirely suitable for their intended use while having aesthetics far superior to mass produced pots. The opportunity is to help all potters achieve those standards of excellence. I hope this web site will provide a small step toward that end. In addition to the information provided here there is another web site I manage -- www.masteringglazes.com -- which provides information about two products which offer much more in depth information on the specific subjects of making durable and attractive glazes for pottery. The covers of those two products are illustrated below and I hope you will visit that site also. 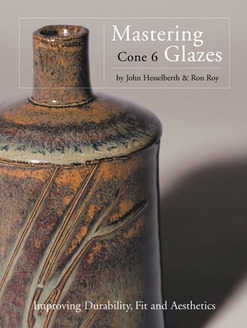 Mastering Cone 6 Glazes, coauthored with Ron Roy, has become a standard reference book and for potters working at Cone 6. 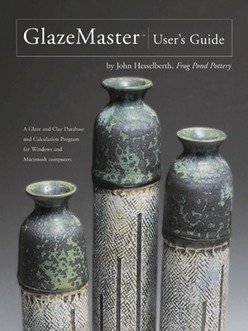 It provides detailed guidance on making and testing attractive glazes that are durable in use and meet all the requirements for quality functional pottery. It is also useful for potters working at other firing temperatures by providing general guidance on the fundamentals of glazes. The original color version of this book is sold out; however it is available as a eBook or in a black and white edition. Click here for more information. GlazeMaster™ is a software program for both Windows and Macs that helps potters calculate the composition (unity formula) of their glazes in a way that helps them get the right balance of properties. It is also an excellent glaze recipe database providing not only storage of the recipes themselves but of up to 4 photos of each glaze. Other features include analysis of line, triaxial, and quadraxial blends, easy entry and editing of recipes from drop down menus and more.